2014 November 08: for iPhone 6, 6 Plus, 5s, 5c, 5, 4s, Samsung Galaxy s5, s4, s3, Note 3 ✭ FREE STYLUS ✭ Premium Quality Universal (New) A Must-Have this Holiday Season! Kobert Waterproof Case for iPhone 6, 6 Plus, 5s, 5c, 5, 4s, Samsung Galaxy s5, s4, s3, Note 3 ✭ FREE STYLUS ✭ Premium Quality Universal (New) A Must-Have this Holiday Season! Do you like to take your camera to the beach but are worried about the ocean and sand? 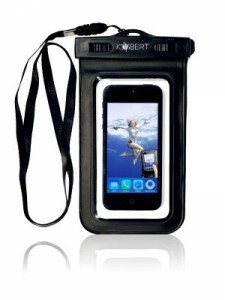 The Kobert Waterproof Case may be the answer! I really like this case! What is impressive is that it really works as well as it claims. I like to take my phone to the beach but it’s usually not an easy task to do with the water and the sand. I like this case because you can even use the touch screen while the phone is in the case. This wasn’t something that I could do with a previous (different brand) case that I had bought during the summer. I am amazed that I can use the phone camera while it is in the case. It has an impressive secure snap and lock/unlock mechanism and a neck strap. The case seems quite sturdy and I know I already said this..but I really love that I can take photos at the beach without removing the phone from the case! I also love the BONUS stylus pen that was included to use with the touch-screen. 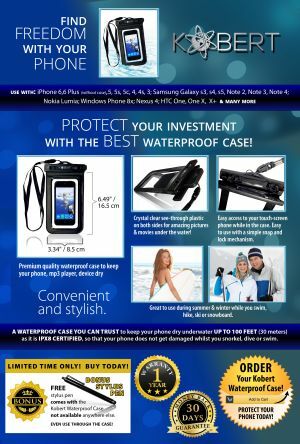 This is a Must-have for the beach, pool and water parks! -BONUS stylus pen will be included to use your mobile’s touch-screen in the waterproof case. You can purchase this product on Amazon.com.